Microsoft is looking to expand on its artificial intelligence program with the reported purchase of UK-based developer SwiftKey, makers of the popular cross-platform predictive keyboard of the same name. Citing people familiar with the matter, the Financial Times reports Microsoft paid out some $250 million for SwiftKey and its underlying technology. While the firm markets an eponymous predictive keyboard that has seen success on both Apple's iOS and Google's Android platforms, as well as BlackBerry 10, it's the artificial intelligence that Microsoft is after. "There's a war for talent in artificial intelligence —and companies like Google and Microsoft recognise the best talent is in the UK," one source said. Current versions of SwiftKey apply an artificial intelligence algorithm —the so-called "n-gram" database —that monitors user input and applies a word sequence model to return highly personalized next-word predictions. The process is more accurate than existing software keyboards that suggest words based on low-level pattern recognition running on static databases. Of particular interest is SwiftKey's Neural Alpha product for Android, a predictive keyboard that taps into an artificial neural network capable of detecting linguistic structures. On a basic level, an ANN is designed to mimic human brain functions by "learning" or understanding not only word connections, but context and meaning. The neural model is trained to parse through and connect millions of inputs (words), assigning each a numeric code. This allows the system to dynamically compare words to understand their relationship and meaning, SwiftKey says. By adding on a prediction module, SwiftKey hopes to quantify nuanced human language, a complexity often lost on machines. 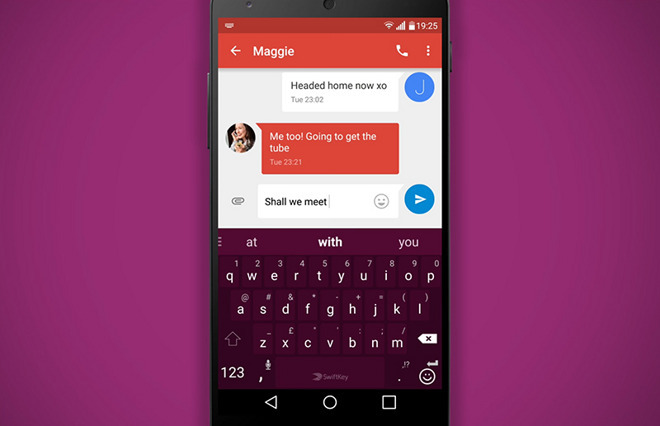 As the acquisition is not yet public knowledge, Microsoft has declined to comment on its plans for SwiftKey. For now, the SwiftKey Keyboard app is currently available as a free download on the iOS App Store.